Julian Bellmont jug - 4⅛" (104 mm) high. Julian Bellmont started working at Aldermaston Pottery with Alan Caiger-Smith in 1980. In 1993 he left to start High Street Pottery at Kintbury, Berkshire. He works in fine stoneware making hard-wearing and high quality domestic and decorative items. 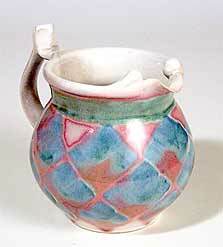 His use of colour and lustre glazes are particularly adimired.